I was wandering through my local library when I saw the name “Satchel Paige” on the spine of a graphic novel and was immediately intrigued. The legendary pitcher has always interested me and I wanted to learn more. Even though it was written for young adults I borrowed it, figuring it was worth a look. It turns out that I’d picked a fantastic piece of work by independent comic stars James Sturm and Rich Tommaso. In their hands the plight of African American sharecroppers in the Jim Crow south and the magic of Satchel Paige comes to life. If you’re not familiar with Paige, then you’re missing out on a nearly mythical figure in American history. Argued by some as the greatest pitcher of all time, Paige claimed that he had pitched in 2,500 games and won 80% of them. Of course, his claims can’t be verified since, as an African American, he couldn’t play in the major leagues until Jackie Robinson had broken the colour barriers, and Paige was in his 40s. Baseball historians have since confirmed that he won at least 291 games between various leagues across the United States and Carribbean. Tomasso uses sepia tones picked out with heavy black ink to render the tale of Emmet Wilson, his son Emmet Jr. and, of course, the legendary Paige. His style is reminiscent of children’s illustrators of the 40s and 50s like H.A. Rey of Curious George fame or Ezra Jack Keats’ Snowy Day. At first, Tommaso’s plain, two-toned artwork seems too simple for the subject matter. However, he handles graphic images like the lynching of a sharecropper with great sensitivity. Tomasso deservedly won an Eisner Award in 2008 for his work on the book. Sturm’s script draws the reader in and creates a real sense of tension, particularly surrounding the menacing Jennings twins who seem capable of anything. He also does a good job of differentiating between the latent racism of Southern society represented by segregated baseball fields or the paternalistic Mr. Jennings and the blatant hatred of his twin boys who engage in violent hate crimes. Most impressively, Sturm handles the enigmatic Paige with a rare touch that maintains his mystique while making him into an early champion of racial toleration. The penultimate scene where Paige faces down the bigotry of the Jennings brothers is a slow, simmering burn that the reader can savour. The Center for Cartoon Studies commissioned this book, and they deserve full credit for putting together a wonderful package that includes online resources like samples of Tomasso’s draft work and other tools for teachers. Of course, they also put the Sturm-Tomasso tandem together which is what makes the book great. 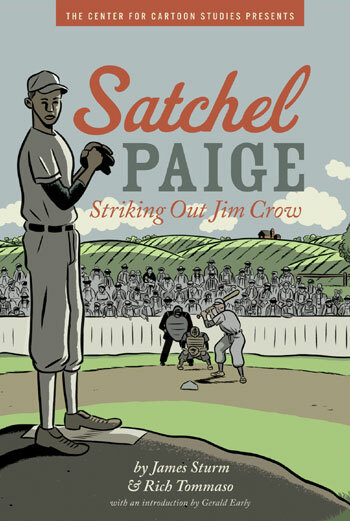 Although geared towards adolescents, Satchel Paige: Striking Out Jim Crow is an enjoyable, light read that doesn’t shy away from some tough subjects. Sturm and Tommaso are deft storytellers that express a myriad of emotions with minimal words and art.